This is the 5th in the HELLO KITTY series. It is rare, and also a little exciting to come across a character of which you had no previous knowledge. 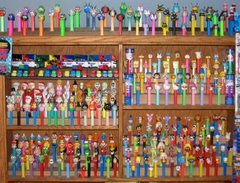 We knew of no announcement this was coming or indication that was on any of the PEZ news sites nor had it showed up on e-bay. It just showed up in stores. When I first saw it I didn't know if it was part of the Halloween series or some other obscure series. 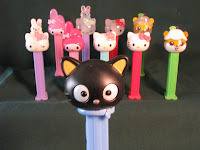 Frankly I don't know enough about the HELLO KITTY phenomenon to know if there are any others that could be released as a new PEZ in the future.